As one of Trip Advisor’s top destination spots in the Ely area, we take pride in knowing our stuff! At Moose Track Adventures, our staff is highly experienced and our guides know the Boundary Waters like the back of their hands! Every spring, we ramp up the fun and energy at Moose Track Adventures and we can’t wait to hit the ground running in 2016! In order to make the experience for all of our guests top notch, the canoe and camping gear we use is the best on the market. Because we have over 20 years of planning and executing camping and canoeing Boundary Waters vacations, we know a thing or two about what brands work and what don’t. All of our gear we supply you with, as Boundary Waters Outfitters, are high quality as we depend on this equipment during all types of conditions. So take a look at all our Ely/Quetico Outfitting Equipment that we supply our adventurous customers with this upcoming season! Wenonah Kevlar Canoes: If you are an avid canoer, you are familiar with this brand. We have all sizes from solo to 4 person canoes. You can pick up a canoe as part of a package or just rent this bad boy on your own. Bent Shaft Wooden Paddle: This lightweight elbow paddle makes getting around the Boundary Water much easier. It is extra-rugged, looks great, and has long durability. MTI Livery PFD: No one should go out on the water without this personal floatation device. It fits a range of sizes and has great room for mobility. The four side straps make it easily customizable for all different size wearers. Kondos Outfitter Pack (canoe pack): Keep all your belongings safe with this easily adjustable pack. It easily contours to your body and rides well on long trips. Marmot Tents: The Marmot tent is both easy to set up and extremely well made. The tent itself is roomy, offers lots of storage and has a designed gear pouch inside the tent with sturdy tie-out loops on the outside. Marmot Trestles-15 degree sleeping bag: It can get quite chilly in the spring months at Moose Track Adventures. This specific sleeping bag is built for backpacking and trips where cool climates are typical. Sleeping Pad: Not everyone enjoys sleeping on top of rocks. This standard pad is lightweight, travels easily and provides our guests a more comfortable place to rest their body after a long day of hiking. Coleman Peak 1 Feather 400 stove: This baby fits in most backpack pockets and is capable of flame control (from simmering to boiling). It is sturdy, lightweight and operates on clean-burning Coleman® Fuel. Crazy Creek camp chair: Protect yourself from getting wet when you sit on the ground. This chair insulates from cold and snow and provides outstanding comfort anywhere! We are ready to outfit you with all the best products that are on the market. The question is, are you ready to get out there and have an adventure? 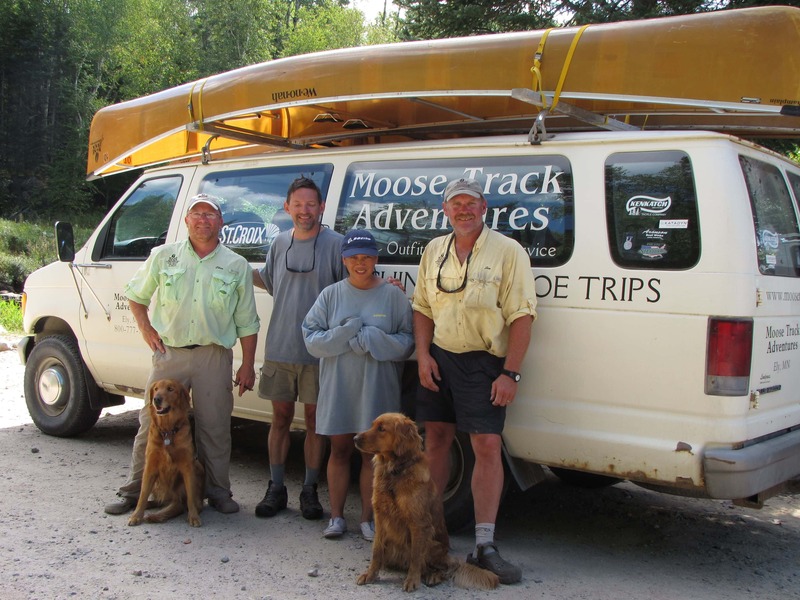 Call Moose Track Adventures and book your Ely, MN canoe and camping trip today! For more information about the products we use or booking your trip to the Boundary Waters, call us at 218-365-4106.